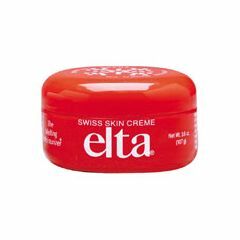 Very nice and soothing cream! Not Greasy. Moisturizes. Light. Absorbs Quickly. Goes On Smoothly. Moisturizes Well. Long Lasting. Soothes Skin. Softens Skin. Dry Skin. Dry/Chapped Skin. Sensitive Skin. Winter Dryness. Daily Use. Deep Moisturization. Great for Tired Feet..
My husband is diabetic and his feet swell and are very dry. He gets great comfort when this is applied before putting on his socks. He loves it and it does keep his skin soft. Moisturizes. Softens Skin. Light. Goes On Smoothly. Moisturizes Well. Soothes Skin. Long Lasting. Dry Skin. Deep Moisturization. Dry/Chapped Skin. Winter Dryness. Sensitive Skin. Great on diabetic's dry skin ! Best stuff since sliced bread! Softens Skin. Soothes Skin. Moisturizes. Daily Use. Fine Lines/Wrinkles. Sensitive Skin. Redness/ Blotchiness. I was introduced to this by the head of dermatology at a Boston, MA, hospital. I use it for washing, cold weather protection, after sun exposure soothing. I wouldn't be without it!